This app is designed to painlessly expose yourself (or your child) to tiny amounts of one of your triggers while doing something very positive. The trigger is altered (reduced) so you don’t have a real misophonic reaction. All that you experience is a very minor “tap” on your body. Under this condition, your Lizard Brain (autonomic nervous system) can slowly stop responding to the trigger. The app runs in background while you are doing something fun on your computer. Maybe you like to watch Netflix or YouTube videos, or maybe you like to play video games. You can also listen to music with a playlist defined in the app. The most important thing is that you are doing something very positive (or relaxing) and you occasionally hear a tiny trigger. 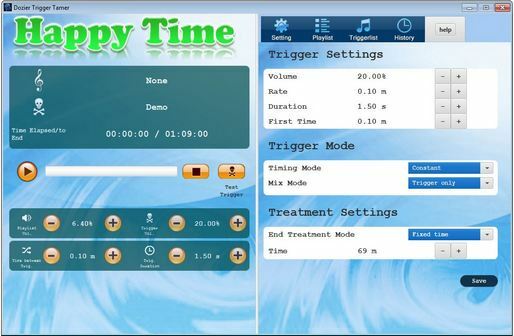 The treatment really is “Happy Time” because your trigger only creates an “eye-blink” strength response to it. It is HIGHLY RECOMMENDED that you have guidance for the use of the app from Tom Dozier for maximum benefit from this app. If you want to do the “treatment” while watching videos or playing games, all you need to do is define the trigger (trigger file name, volume, length to play, and time between triggers). If you want to listen to music with the app, you will need to load your favorite music (mp3 files) onto your computer and define the playlist in the app. 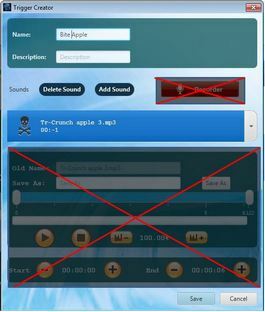 For the trigger files, you can either record the sound yourself (using other software), or find a suitable file on the internet. You will probably want someone less to record your triggers for you, so that you don’t have to experience the real trigger sounds. The app was planned to have recording and editing features, but these do not work at this time. The Trigger Tamer allows you to control the volume and length of the trigger so that you have only a tiny response to it. Most people only have a tiny physical response — no (or minimal) emotions. You also control how often you hear a trigger – you control the strength of the trigger. You are the boss. You control your treatment. Again… It is a non-aversive trigger. NO PAIN. It is 99.9% fun, and 0.1% modified triggers. this method may be effective. If you trigger to the chewing sounds of anyone (and anywhere), then this method is unlikely to produce improvement in the way you react to real-life trigger sounds. AS OF THE END OF 2017, THERE HAVE BEEN NO SUCCESSFUL CASES OF ELIMINATING THE RESPONSE TO A GENERAL TRIGGER SO THAT THE SOUND NO LONGER CAUSES A PROBLEM RESPONSE IN ALL REAL LIFE SITUATIONS. You will see great difference when the trigger is short (0.2 to 0.8 seconds) and soft. At a low level, you will not trigger at all. You can then increase the length of the trigger and the volume until your misophonia reaction is almost like an “eye blink.” You will feel it slightly, but it will end instantly. At this level, there is generally no (or minimal) emotional reaction. Without the emotional reaction, you can pay attention to your physical reaction to the trigger sound, which varies greatly from person to person. You will feel it, but not have the typical emotional reaction. Under these conditions over 95% of individuals have identified a physical reflex that is part of the misophonia response to the trigger. The Trigger Tamer allows your lizard brain (your brain stem) to reduce your physical reflex response to the trigger. 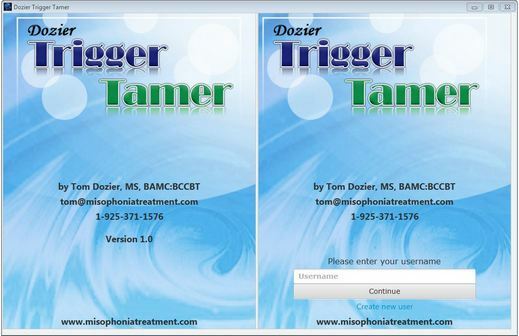 There are 7 tutorial videos for the phone version of this app at https://misophoniatreatment.com/trigger-tamer-app/. The functions are the same, but the screen layout is a bit different. GUARANTEE: If you are not satisfied in the first 85 days (PayPay requirement for refunds), email tom@misophoniatreatment.com and request a refund. You must state the email address used with PayPal for the purchase. You will receive a full refund within 5 days.